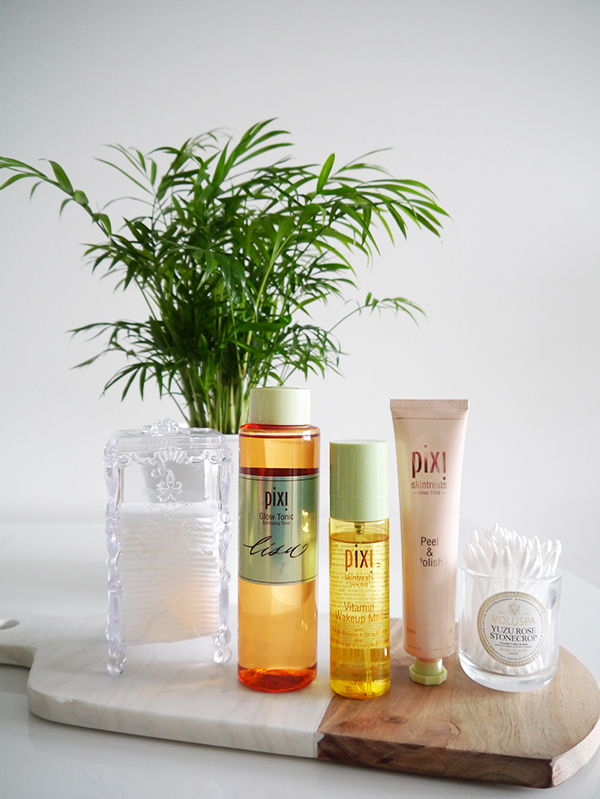 Pixi Beauty has been on my radar for a while, but I haven't had firsthand experience with their products until recently when I was invited to learn more about the brand and walked away with a bag full of samples to test and review. While I haven't gone through everything yet—there was a lot in that goodie bag—I do have a few skincare standouts to share with you today, all of which are available at Shoppers Drug Mart right now. Pixi was founded over a decade ago by makeup artist and product developer Petra Strand, who brought 20+ years of experience to developing her own label. Pixi's approach is all about "pure, awakening, skin-loving products that create a naturally radiant 'just had a good night's sleep' look"—fuss-free, easy-to-use cosmetics and skincare that fit into busy lifestyles. (Side note: Petra sounds like a Lazy Girl after my own heart.) The brand is particularly known for its feminine, pastel green packaging (inspired by Petra's love of Ladurée pistachio macarons) and cult favourite Glow Tonic. 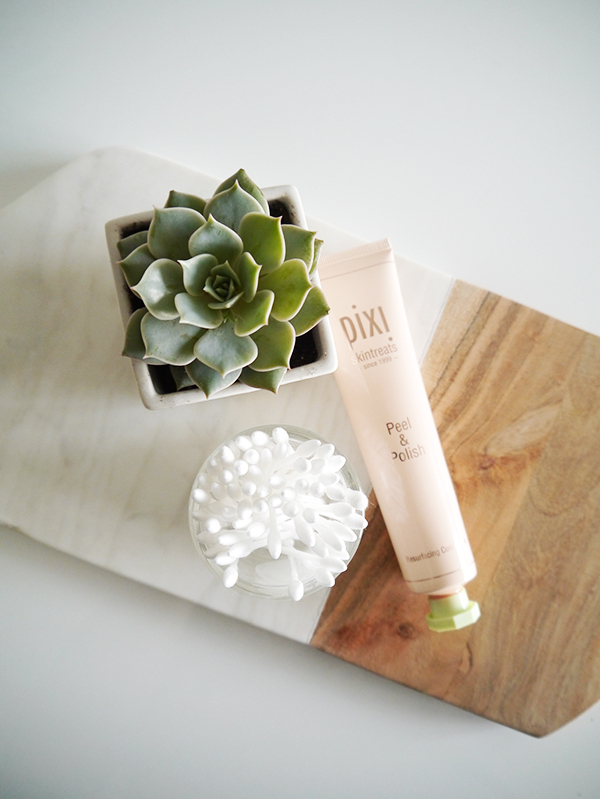 The Pixi Skintreats skincare line isn't all-natural, but it does boast a lot of natural ingredients and extracts, combining the best that Mother Nature has to offer with effective chemical ingredients. In writing this post, I spent a fair amount of time Googling ingredients, most of which seem to be low concern according to the EWG Skin Deep Cosmetics Database. The only ones that are of some concern are PEGs (which may be contaminated with 1,4 dioxane—a potential carcinogen and cause of birth defects—during the manufacturing process) and artificial fragrance. Before I dive into my thoughts about three of the Skintreats, there are a couple more worthwhile notes to share. First, even though Pixi is available in drugstores, the price point (approximately $20-40) is higher. Second, don't let the pastel packaging fool you—these products are potent. Most of the ingredients are active and there is little to no cheap filler, which explains the higher price points and the efficacy. Pixi Skintreats Peel & Polish ($34) is a salon-strength exfoliant that relies on 6% lactic acid, papaya enzymes, and a grainy texture to reveal your glow, along with natural ingredients like sunflower seed oil, witch hazel, and cucumber extract to soothe and nourish. The formula looks like a grainy orange gel but turns white once applied. You can leave it on for up to 2 minutes, lightly massaging skin for the first 30 seconds for extra exfoliation. This is the sort of chemical/manual, powerful exfoliant I love—you'll notice a difference right away the first time you use it—but it does sting slightly and it is potent stuff, so set your phone timer when you apply it and don't leave it on a second longer than instructed. The instructions say this can be used AM or PM, 2-3 times a week, but if your skin is a bit on the sensitive side like mine can be I'd suggest using it at night 1-2 times a week, followed by a calming mask and thin layers of serum, face oil, and moisturizer. 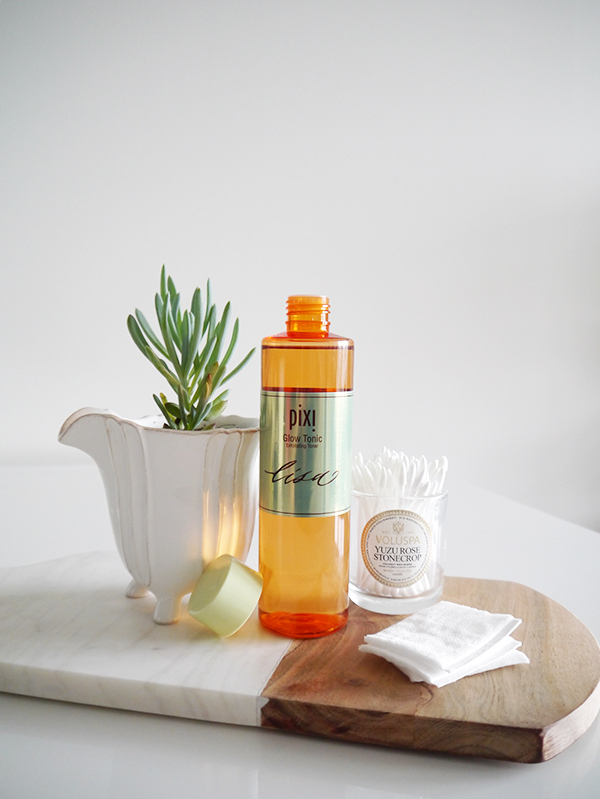 If you're using Peel & Polish regularly, skip Glow Tonic (reviewed below); using both products will over-exfoliate skin and cause redness and sensitivity. As I mentioned before, despite the "tonic" moniker and the feminine packaging this is potent stuff. The instructions say this can be used AM and PM after cleansing, but if your skin is too sensitive for that, the best time to use it is at night, maybe even every other night. The exfoliating formula will prep skin to better absorb serums and oils, and a good night's sleep will go a long way in calming any irritation. In fact, Glow Tonic is so powerful that I'd suggest reviewing the other products in your skincare lineup if you're using it regularly; swap out formulas that have exfoliating ingredients for more calming versions and skip the harsher once-or-twice-weekly scrubs entirely. If you find Glow Tonic too strong for AM and PM use and it's best for nighttime, what should you use if you're craving a toner in the mornings? This is where Pixi Skintreats Vitamin Wakeup Mist ($20) comes in. The formula's orange blossom water and citrus extracts refresh the senses and invigorate a tired complexion, while vitamin C provides antioxidant and brightening benefits and hyaluronic acid and glycerin draw moisture into the skin. The nozzle kind of "pulses" product onto the face instead of creating a fine all-over mist, so I find it best to spritz and then spread the toner around with clean fingers. Be careful not to over-apply—excess product will sit on top of skin and pill and roll off. Three spritzes—one on each side of the face and one on the neck—is sufficient. Considering this is my first foray into Pixi's offerings, I'm more than impressed. Not only does the skincare do everything it claims, the results are noticeable immediately. (Because it's so powerful though, you should follow directions closely and avoid being too cavalier about mixing and matching products, especially ones with exfoliating benefits.) Also, the packaging! I have to admit, I love opening my medicine cabinet and seeing all the colours and that personalized Glow Tonic bottle in particular. 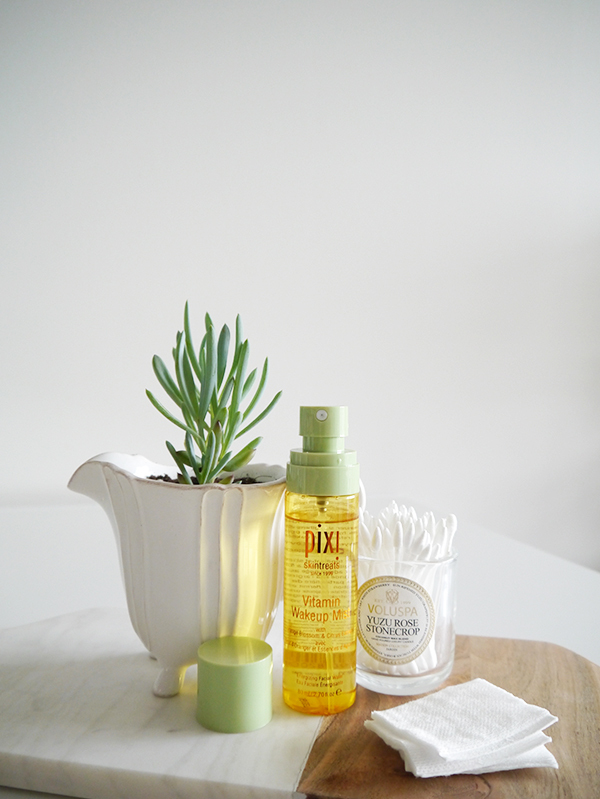 Have you tried any Pixi products? Any favourites you care to share?